And I want to sort it by value such that when I loop through it later on ROB comes first, then BOB, etc. But none of them seem to actually DO anything. Printing the array out to the console before and after result in it coming out in the same order. Arrays can only have numeric indexes. 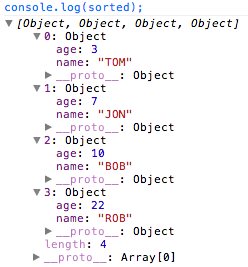 You'd need to rewrite this as either an Object, or an Array of Objects. The Array is a class with logic to handle numeric-sequential indexes. Now answering your response, Mappings have no order, there is no guarantee about the order it will iterate so there is no such thing as "sorting a mapping"
It's up to your needs. So to do this you would need to change your data structure a bit. // push a few objects to the array.